« The meaning of "gambari"
As my father returned to Pullman for his sophomore year at WSC in the fall of 1944, the construction at Hanford was complete, at a total cost of $230,000,000 (equivalent to more than ten times that amount in current dollars); the reactor was started up on September 26, 1944. The plutonium manufacturing process had never actually been validated—there had been no time—so it was not surprising that the reactor sputtered and died. It restarted itself, then stopped again. An urgent call went out to Enrico Fermi, the inventor of the process, to analyze the problem and devise a fix, which he did. The cans taken to Portland and from there by train to Los Angeles on February 2, 1945, contained the first few grams of Hanford plutonium, laboriously extracted from the uranium isotopes produced in the reactors. In California, the cans were turned over to a junior army officer from Los Alamos, New Mexico, where the actual bomb was to be constructed. By May 1945, a system was in place where regular shipments of Hanford plutonium were being made to Los Alamos, using one-kilogram jugs that looked like big thermos bottles, in convoys protected by submachine guns. The scientists at Los Alamos labored mightily and finally produced a test bomb containing Hanford plutonium at its core, which they named “Gadget.” It was detonated at the Trinity Test Site near Alamagordo, New Mexico at 5:29:45 a.m. on July 16. 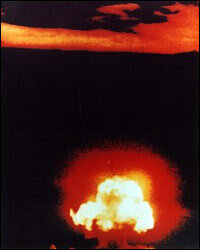 Seeing the detonation, Dr. J. Robert Oppenheimer, the head scientist of the Manhattan Project, recalled a line from the Bhagavad-Gita , the Hindu text he had been studying: “Now I am become Death, the destroyer of worlds.” The cloud reached a phenomenal height, over 50,000 feet. The blast was certainly a rude morning wake-up call for one particular wild jackrabbit, found dead and partially eviscerated eight hundred yards from ground zero after the blast. The A-bomb—its history and its existence—provides us with a rich palette of colors to draw our own pictures on topics as varied as the nature of the physical world, war, man’s thirst for knowledge, and death. This entry was posted on Sunday, January 16th, 2005 at 08:46	and is filed under history and culture. You can follow any responses to this entry through the RSS 2.0 feed. You can leave a response, or trackback from your own site.